My friend Gary Murning wrote a very good post about the misuse of terror laws. This always strikes a chord with me, but for some reason, I have a really hard time writing about it myself. So I’m always excited to find other articles that reflect my views. While we’re on the subject of abusing power, PZ Myers posted something yesterday about his state practicing anti-democratic, anti-liberty tyranny right now. Part of the article Professor Myers quotes says that teams of police in riot gear entered and searched the homes of people suspected of planning a protest of the Republican National Convention. And that’s the tame description! Go to Pharyngula to get more details, but prepare to be disgusted. My darling husband, Mike, author of The Odd Blog, wrote a very good piece discussing Obama’s choice for a running mate. Be sure to check out the two drabbles he posted as well. My honey is multi-talented! Truthwalker, a former Christian, wrote a few days ago about the benefits of not believing in (or trusting) a god in a disaster. Being a former Christian myself, his thoughts echo some of my own. He and his family also evacuated at 0600 this morning to avoid the wrath of hurricane Gustav; I’ll be on the lookout for their safe return! Chris Petroni’s Allusions of Grandeur made me feel like a kid in a candy store this morning — so much yummy stuff to choose from, I can’t make up my mind. One post I found particularly interesting, though, is entitled, Why Japanese has so few swear words. From a blog I only recently discovered and just can’t get enough of, please read this message from Gawd (aka God) to Ray Comfort who, by the way, is clearly bananas (that was just too damn easy). Please check out the many other postcards from God; He has quite a few words for the presumptuous mortals who keep disturbing His vacation. If you want to get on His good side, though, turn up with a nice bottle of Scotch. And thanks to the Postman who diligently delivers Gawd’s postcards so the rest of us can know what’s really on this deity’s mind. I just hope he (Postman) doesn’t start thinking I’m some kind of creepy stalker. That’s all for today. I’m starving and have lots of crap to do. A couple of months ago, my friend, Gary, received his first blogging award! 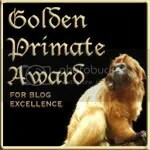 I was not surprised at all to learn that Gary had received an award for excellence in blogging. He is an outstanding blogger, after all. I was caught off guard, though, when I saw my name on the list of people to whom he had passed on the award. Perhaps it was shock that caused me to miss the part that mandates passing it on (OK, that’s probably not what caused it but it sounds better than admitting that I had a Duh! moment). I would like to thank Gary for bestowing upon me this honor. He is a brilliant writer whose opinion I value very much, and to receive such an award from him is very meaningful and encouraging. I would have passed it along to Ed Darrell of Millard Filmore’s Bathtub, but Dorid had already given it to him. My husband Mike was on Gary’s list as well. Sound familiar, my fellow countrymen? I thought it would be interesting for today’s Flashback to take a look at the roots of what served as a de facto national anthem of the United States for much of the 19th century. While the new Press This Bookmarklet has received mostly good reviews, some people have expressed concerns that it only makes life easier for content thieves. I confess that when I first learned about this new WordPress feature, I had the same concern, but that was based on faulty information given to me by someone who had used it. I was under the mistaken impression that the feature copied entire posts and/or pages. I now know that it does not do that, although it can certainly be abused in that way. This seems to be what the majority of complainants are arguing: it’s a bad idea because content thieves can use it to steal other people’s work. But content thieves were stealing other people’s work before and will continue to do so if it is removed. People who steal content will do so regardless. People who do not steal content are not going to suddenly trash their values and start plagiarizing just because now it can be done with greater efficiency. To those of you who think WordPress should not have this feature, I submit that you should stop blogging altogether. After all, posting your content on the internet makes it easier for people to steal it. And we should probably stop emailing and using instant messengers because they’re also prone to abuse. Better yet, let’s just shut down our computers and call it quits, because the internet itself is prone to abuse in uncountable ways. Now that we’re no longer using computers, we can focus on all the other things that are potentially dangerous or harmful. How about cars? We shouldn’t have cars because people can drive them while intoxicated and kill or injure themselves and other people. We should probably get rid of our phones too, because they’re often used by stalkers to harass people. And while we’re on that slippery slope anyway, let’s go ahead and dump our kitchen knives, since people have been known to use them as weapons. And the kid’s baseball bat needs to go — it could be used to vandalize someone’s property. Matches can be used to commit arson. Belts can be used to beat children. Pillows can be used to suffocate people. Antifreeze can kill animals. People can drown in swimming pools. Or bathtubs. Ropes can be used to strangle people. Cameras can be used to exploit people. Binocular and telescopes can be used to spy on people. Sleeping pills can be used to commit suicide. Or murder. Gasoline, paint and a variety of other things, when huffed, can result in hypoxia. We don’t get rid of any of those potentially dangerous and harmful things because we recognize their usefulness. They make our lives easier and often more enjoyable. Let’s keep Press This for the same reason. There are steps you can take to deal with content thieves, and those steps are exactly the same with or without this new feature. Now go and press something. Dswerling, author of One Christian’s Journey, wrote a post back in May entitled What Atheists Really Want. When I saw that title, I thought, “Oh great! Another Christian who thinks s/he knows my mind better than I do”. They’re not exactly in short supply. Bingo! What more can I say? Faith is a form of trust; trust in God or Jesus or Allah or Zeus or Ra or any other deity you pick, but at its heart all faith is trust that somehow things are going to work out just fine in the end, in one way or another. I think even a lot of Atheists certainly have this trust, they just can’t reconcile it to trust in something greater, a reality above the reality that we observe in the physical world. However, this is a personal issue for everyone. After all, how would you ever find scientific proof that say, your mother or girlfriend or wife or father or boyfriend or husband loved you? How would you ever truly know another person was trustworthy? You simply cannot know, you are left with an act of faith on some level, and no one ever talks of finding scientific reasoning for these trust issues. So if we aren’t trying to scientifically prove why we can trust our mother or father or any other humble human, why would we bother trying to scientifically prove why we can trust the infinite creator of the universe? I would like to begin by addressing the last sentence there. Good thing I’m not one for scrapping! My son is an exceptionally bright young man. For the duration of this post, he will be referred to as John. Rather than giving you details of the many ways in which he excels, let it be enough to say that his teachers have always remarked on how advanced he is intellectually; he’s creative and artistic as well; he draws, writes stories, and turns every game into a screenplay, probably because he wants to write and direct movies someday. Of course, that will come after he finds a way to implant some sort of microchip into the joints of people who can’t walk so that their own legs function similarly to an artificial prosthetic called the C-Leg. John is constantly thinking, planning, creating and building things. He’s more interested in setting trends than in following them. He is extremely well spoken and articulate for his age, and his teachers and counselors often say that he is a “joy” to work with, commenting on how very “engaging” he is. He is an honor roll student who has already received several academic awards and commendations. John is also sensitive, compassionate, well-mannered and respectful. He’s always willing and eager to help anyone who needs a hand. He tells the truth even when it might get him into trouble, and even if he could get away with lying. As his mother, I’m probably biased, but many of these same observations have been made by uncountable people (often strangers he’s lent a hand to without being asked) throughout his life. The trouble this creates for John is that he very rarely meets other kids his age who relate to him. If that’s not bad enough, he was actually picked on, made fun of, called names and even bullied for being “brainy” and attending the Gifted and Talented (GT) program last year. Now that I’ve familiarized you somewhat with John, let me tell you about “them fightin’ words”. My son just left for his first day of middle school. I thought I was ready for it; I thought I wanted him to go back to school. The house hasn’t been quiet for two months, and I thought I’d enjoy the peace. But it’s too quiet now; all I hear is the hum of the fan in the next room, and the ticking of the clock above my head. How apt! I cried a little before sitting down to write this. My mind took me back to the days when my baby was learning to walk. His nose crinkled when he grinned, exposing all four of his teeth, as he staggered across the room. When his diapered bottom hit the floor, he giggled. He didn’t seem discouraged by falling, but rather pleased because he’d made it as far as he did. I hope he never loses his glass-half-full perspective. He’s going to need it more now than he ever has. I didn’t get to say goodbye before he left. Not the way I had wanted to. His friend came over to get him, and there is to be no lovey-dovey business in front of friends. I understand that and I respect his boundaries, but things felt incomplete. The kid came over twenty minutes earlier than planned, and so we were cut short to begin with, then my son said, “Bye, Mom!” and walked out the door without looking back. I called him on his cell phone to tell him I love him and wish him a good day. I thought it’d be OK as school hadn’t yet started. He abruptly informed me that he’s not allowed to use the phone on campus and that he was shutting it off. “Bye, Mom!” Bzzzz…. So here I sit on The Big Day, tears streaming down my cheeks, unmotivated to do any work. Good thing I’m allowed to set my own hours. I know I sound terribly clingy, but I’m really not. Not as much as this post might suggest, anyway. I certainly won’t tell my son that I cried or any of that. I just thought that writing about this might help me feel better.